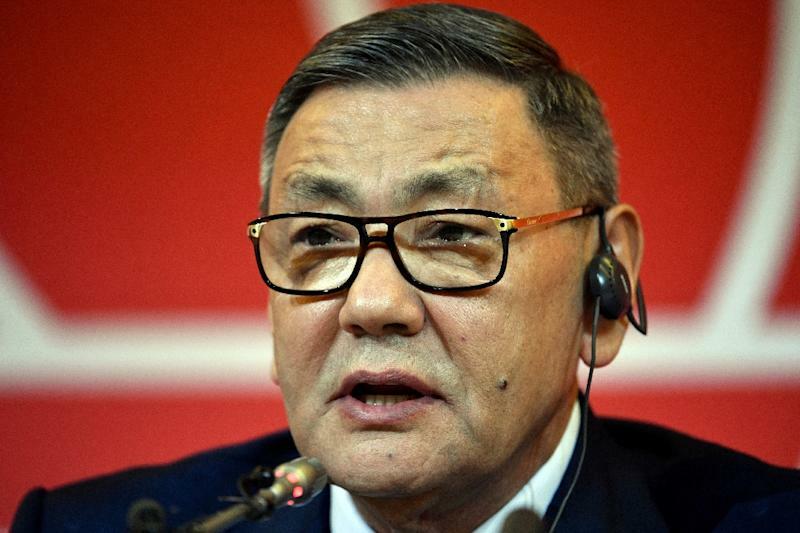 Lausanne (AFP) - Gafur Rakhimov stepped down as head of the AIBA, world amateur boxing's governing body, on Friday amid a spat with the International Olympic Committee, who welcomed the move as they mull the status of boxing at the 2020 Tokyo Games. "I have informed the AIBA Executive Committee of my intent to step aside as AIBA President," Rakhimov said in a statement. Olympic authorities told AFP on Friday they have "taken note of the intention of Mr Rakhimov." "We will carefully evaluate the effects of this intention for the position of the AIBA President in the AIBA structure and the potential impact that it may have," the IOC told AFP. "This inquiry addresses many other aspects like the AIBA Finances, governance and ethics, anti-doping and refereeing and judging." The status of boxing is on the agenda for IOC executive board meeting in Lausanne next week, from March 26-28. The Uzbek businessman has been engulfed in controversy since he was elected in November because the US Treasury Department has linked him to "transnational criminal organisations", a charge he vehemently denies. Rakhimov said that under his leadership "the work done this last year has revitalised and energised AIBA and boxing". "However, despite these efforts, there have been many discussions these last few months about the future of Olympic boxing. A lot of that was mainly focused on politics and not sport. "While I had truly hoped and believed that sport and politics could be separated, and that the good work and positive changes being infused into AIBA would be recognised, the politically-based discussions have put into question the progress being made throughout the AIBA organisation." Boxing's inclusion in the Tokyo Olympics depends on the outcome of an investigation into AIBA by the IOC, which has presented the body with a list of 41 questions via audit firm Deloitte, who will then report back to the Olympic body. Upon announcing the investigation the IOC suspended qualifying for the 2020 boxing tournament -- making it the only sport not to have its qualifiers approved -- and warned that AIBA could be stripped of the right to run the competition. Rakhimov protested his innocence on Friday, saying the allegations against him were motivated by political battles in Uzbekistan. "Once again, as I have stated before on numerous occasions, I attest and confirm that the allegations against me were fabricated and based on politically motivated lies; I trust that the truth will prevail," Rakhimov said in his resignation statement. "Nevertheless, I have always said that I would never put myself above boxing, and as president, I have a duty to do everything in my power to serve our sport and our athletes. "Therefore, given the current situation, I have informed the AIBA committee of my intent to step aside as AIBA president. "I am convinced that all the good initiatives that have been implemented this last year will serve as a foundation that will continue to strengthen our sport in the future." Rakhimov's emergence as amateur boxing's head in 2018 was only made possible by a series of scandals and accidents of circumstance. Former chief Wu Ching-kuo of Taiwan resigned in 2017 amid claims of multi-million dollar accounting fraud. Italian Franco Falcinelli then resigned the position just months after taking over, allowing Rakhimov -- the next most senior vice president, to step up to become first interim and then permanent president.